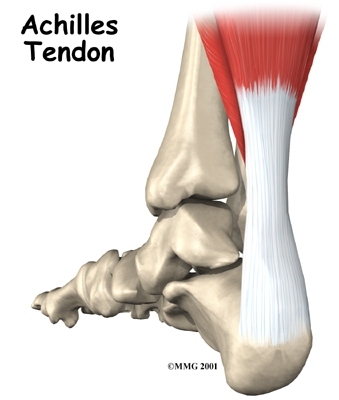 Welcome to Barkman & Smith Physical Therapy's patient resource about Achilles Tendon Problems. 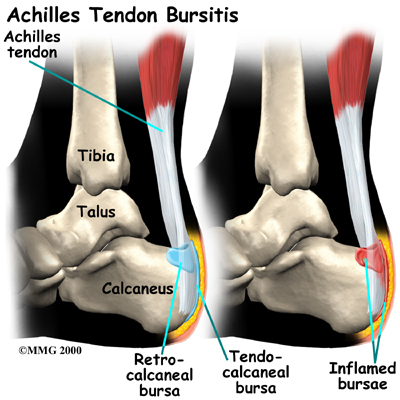 An Achilles tendon rupture is usually an unmistakable event. 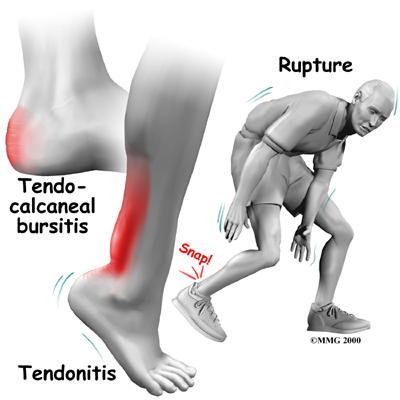 Some bystanders may report actually hearing the snap, and the victim of a rupture usually describes a sensation similar to being violently kicked in the calf. 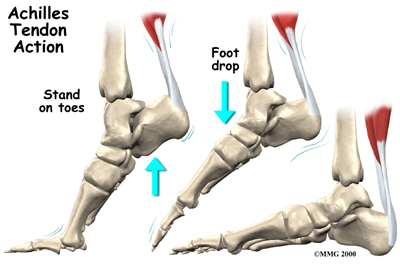 Following rupture the calf may swell, and the injured person usually can't rise on his toes. When you visit Barkman & Smith Physical Therapy, our Physical Therapist may perform some simple tests if a rupture is suspected. Your therapist may move your ankle in different positions and ask you to hold your foot against applied pressure. 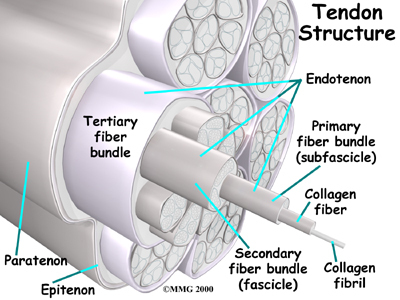 Palpation (feeling for any abnormalities in the tendon) and muscle function tests may also be included. 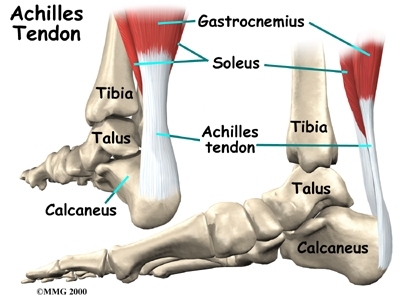 By stretching the calf muscles and feeling where these muscles attach onto the Achilles tendon, we can begin to locate the problem area. When you begin Physical Therapy at Barkman & Smith Physical Therapy, the rehabilitation program that our Physical Therapist prescribes will depend on the specific type of problem (tendonitis or tendinopathy/tendonosis/tendon rupture) present. Our Physical Therapists know when and how to apply cold modalities to reduce swelling and pain, while still allowing the healing inflammatory process. We may also apply treatments such as ultrasound, moist heat, and massage are used to control pain and inflammation. As pain eases, we will progresses your treatment to include stretching and strengthening exercises. An acute injury needs rest. 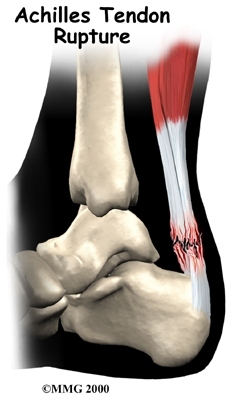 We recommend that initially, you limit activities that require walking on the sore leg. 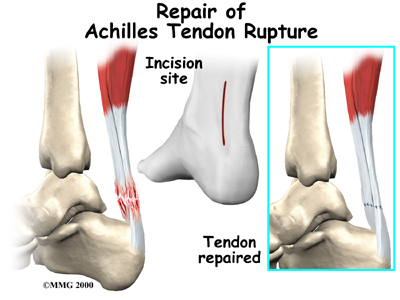 Although the time required for rehabilitation varies among patients, in cases of Achilles tendinopathy, or when a partial tendon tear is being treated without surgery, patients may require two to three months of Physical Therapy. Your Physical Therapist may recommend that a small (one-quarter inch) heel lift be placed in your shoe to minimize stress by putting slack in the calf muscle and Achilles tendon. A similar sized lift will also be placed in the other shoe to keep everything aligned. The Physical Therapy provided by Barkman & Smith Physical Therapy enables patients to gradually return to normal activities. We have specialized programs to guide athletes in rehabilitation that is specific to their type of sport. Nonsurgical treatment might be considered for the aging adult who has an inactive lifestyle. This allows the patient to heal while avoiding the potential complications of surgery. The patient's foot and ankle are placed in a cast for aprroximately eight weeks. 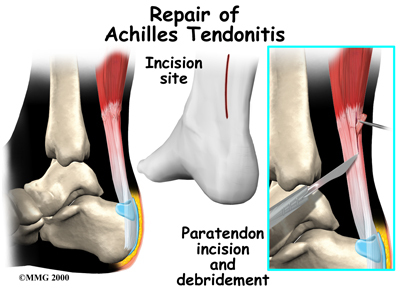 Casting the leg with the foot pointing downward brings the torn ends of the Achilles tendon together and holds them until scar tissue joins the damaged ends. During this time, your Physical Therapist will instruct you in safe and proper crutch utilization. After your cast is removed, our Physical Therapist can have your fitted with a large heel lift to wear for apprximately another six to eight weeks after the cast is taken off. Although the time required for recovery is different for each individual, patients are typically placed in a cast, brace or splint for six to eight weeks after surgery to protect the repair and the skin incision. Your Physical Therapist will help you learn to properly use crutches to keep from putting weight onto your foot too soon after surgery. In this early-motion approach, you begin our Physical Therapy program within the first few days after surgery. Your Physical Therapist in Bedford and Irving may initially use ice, massage, and whirlpool treatments to limit (but not completely prevent) swelling and pain. 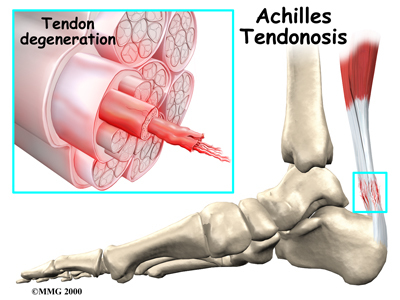 Massage and ultrasound help heal and strengthen the tendon. Our Physical Therapy treatments eventually progress to include more advanced mobility and strengthening exercises, some of which may be done in a pool. 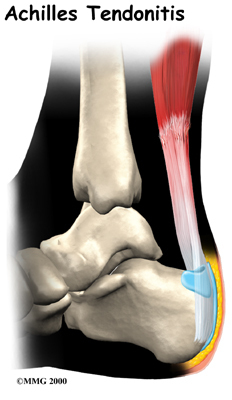 The buoyancy of the water helps people walk and exercise safely without putting too much tension on the healing tendon. The splint is worn while walking usually for six to eight weeks after surgery. As your symptoms ease and your strength improves, our Physical Therapist will guide you through advancing stages of exercise. Athletes often begin running, cutting, and jumping drills by the fourth month after surgery, and although recovery time is different for each paitent, are usually able to get back to their sport by six full months after surgery. Our goal is to help you keep your pain and swelling under control, improve your range of motion and strength, and ensure you regain a normal walking pattern. When your recovery is well under way, regular visits to the Barkman & Smith Physical Therapy will end. Although we will continue to be a resource, you will be in charge of doing your exercises as part of an ongoing home program.